With the third-quarter round of 13F filings behind us it is time to take a look at the stocks in which some of the best money managers in the world preferred to invest or sell heading into the fourth quarter. One of these stocks was CONSOL Energy Inc. (NYSE:CEIX). Is CONSOL Energy Inc. (NYSE:CEIX) a buy here? Prominent investors are getting more optimistic. The number of long hedge fund bets went up by 4 lately. Our calculations also showed that CEIX isn’t among the 30 most popular stocks among hedge funds. Let’s review the recent hedge fund action surrounding CONSOL Energy Inc. (NYSE:CEIX). Heading into the fourth quarter of 2018, a total of 19 of the hedge funds tracked by Insider Monkey were bullish on this stock, a change of 27% from the second quarter of 2018. 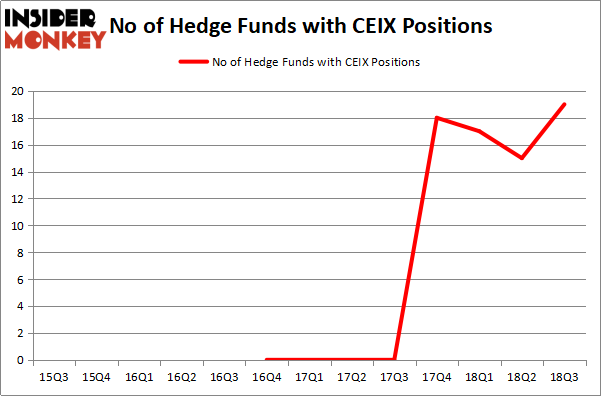 The graph below displays the number of hedge funds with bullish position in CEIX over the last 13 quarters. With hedgies’ capital changing hands, there exists an “upper tier” of key hedge fund managers who were adding to their holdings substantially (or already accumulated large positions). Among these funds, Citadel Investment Group held the most valuable stake in CONSOL Energy Inc. (NYSE:CEIX), which was worth $41.3 million at the end of the third quarter. On the second spot was AQR Capital Management which amassed $22.3 million worth of shares. Moreover, Millennium Management, Mountain Lake Investment Management, and Marshall Wace LLP were also bullish on CONSOL Energy Inc. (NYSE:CEIX), allocating a large percentage of their portfolios to this stock. As aggregate interest increased, some big names have jumped into CONSOL Energy Inc. (NYSE:CEIX) headfirst. Marshall Wace LLP, managed by Paul Marshall and Ian Wace, established the most outsized position in CONSOL Energy Inc. (NYSE:CEIX). Marshall Wace LLP had $12 million invested in the company at the end of the quarter. Jim Simons’s Renaissance Technologies also made a $7.4 million investment in the stock during the quarter. The following funds were also among the new CEIX investors: Jonathan Barrett and Paul Segal’s Luminus Management, Bruce Kovner’s Caxton Associates LP, and Sara Nainzadeh’s Centenus Global Management. Let’s go over hedge fund activity in other stocks – not necessarily in the same industry as CONSOL Energy Inc. (NYSE:CEIX) but similarly valued. We will take a look at CorVel Corporation (NASDAQ:CRVL), Funko, Inc. (NASDAQ:FNKO), Seaspan Corporation (NYSE:SSW), and Tootsie Roll Industries, Inc. (NYSE:TR). All of these stocks’ market caps match CEIX’s market cap. As you can see these stocks had an average of 10.25 hedge funds with bullish positions and the average amount invested in these stocks was $146 million. That figure was $150 million in CEIX’s case. Tootsie Roll Industries, Inc. (NYSE:TR) is the most popular stock in this table. On the other hand Seaspan Corporation (NYSE:SSW) is the least popular one with only 8 bullish hedge fund positions. Compared to these stocks CONSOL Energy Inc. (NYSE:CEIX) is more popular among hedge funds. Considering that hedge funds are fond of this stock in relation to its market cap peers, it may be a good idea to analyze it in detail and potentially include it in your portfolio. HMI Capital’s Returns, AUM and Holdings Here is What Hedge Funds Think About Movado Group, Inc (MOV) Simcoe Capital Management’s Returns, AUM and Holdings Billionaire Leon Cooperman’s New Stock Picks Is Mohawk Industries, Inc. (MHK) Going to Burn These Hedge Funds? 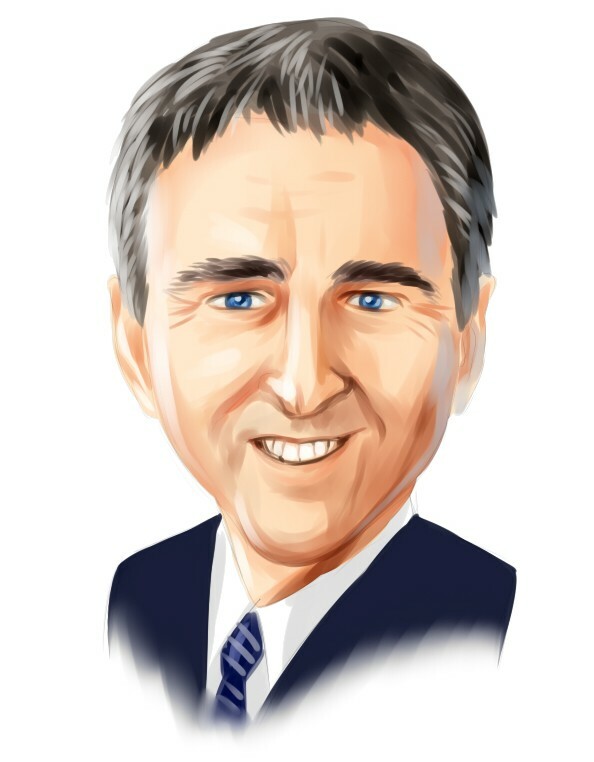 Is MGM Resorts International (MGM) A Good Stock To Buy?